Following a long history of work with one of America's most beloved children's authors, Dr. Seuss (they were the first theater in the world to adapt his work for the stage - 1979's The 500 Hats of Bartholomew Cubbins), Children's Theatre Company is currently premiering another world premiere new work based on his timeless and imaginative writing, a musical adaptation of The Sneetches (published as part of The Sneetches and Other Stories in 1953). Although not without his own prejudices, Dr. Seuss wrote a beautiful story about the evils and nonsensicalness of racial discrimination, inspired by antisemitism in the post-WWII era but sadly relevant to many such prejudices throughout history, including the pervasive prejudices of the present time. Playwright Philip Dawkins (a Playwrights' Center core writer responsible for such work as last year's Charm and Le Switch, not to mention one of my favorite Minnesota Fringe shows ever, Failure: a Love Story) and composer David Mallamud have been working on this project with CTC for over three years, but they couldn't possibly have predicted how timely it would be to premiere it at this specific time in history. A time when clear lines seem to divide Americans on many fronts, when fear and hate result in the othering of people based on ethnicity, religion, nationality, socioeconomic class, or gender identity. 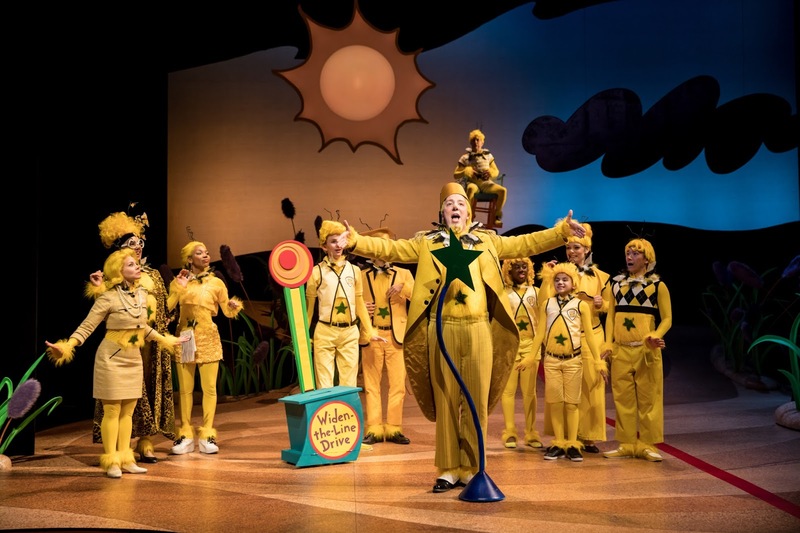 Dr. Seuss's message of moving beyond prejudice to friendship couldn't have come at a better time, especially when wrapped up in the colorful, heart-warming, and highly entertaining package that is CTC's production. Dr. Seuss's original story doesn't have much of a plot, and only one named character. The creators expanded the story, adding characters, relationships, and plot points, in a way that still feels natural to the world that Dr. Seuss created (to read more about that process, watch the Twin Cities Theater Bloggers' interview with the creators). The book has only nameless (and naked) Sneetches: the privileged star-bellies, who have everything they want and believe they are superior to the plain-bellies, who work and toil to provide for the star-bellies and never get to have any fun. The play intuduces a lonely little star-bellied child named Standlee, and Diggitch, an equally friendless plain-bellied grown-up toiling away in the toy factory. Their reluctant friendship (reluctant on Diggitch's part, Standlee is quite insistent) is the catalyst that eventually brings the two sides together. 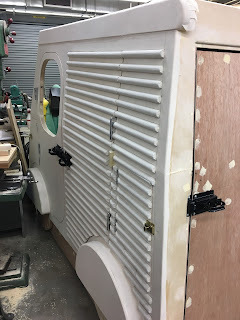 But not before an existential crisis in the form of Sylvester McMonkey McBean and his star-on/star-off machine that confuses the two formerly separate species. Eventually he takes all the Sneetches' money as they try to differentiate themselves from the others, or be like the others, until they realize they're all really the same, star on the belly or no. "No Sneetch is better than each." 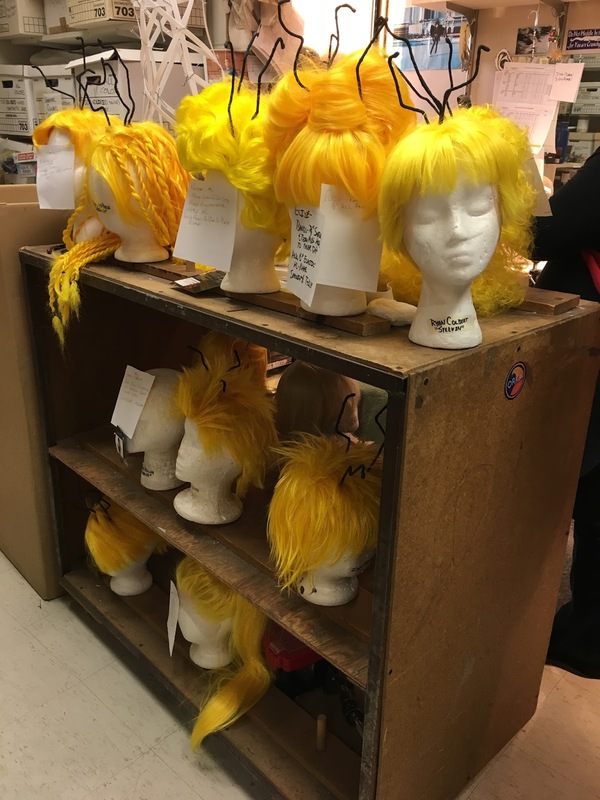 This cast is a dream, and everyone, down to the smallest Sneetch, is so energetic and fully committed to telling this story. The hardest working child actor in town, Natalie Tran, really shines as Standlee, so adorably awkward and sincere in her attempts to make friends. CTC company member Reed Sigmund is also excellent as the crotchety Diggitch, who slowly opens his heart to Standlee and helps bring about a revolution. Highlights in the large ensemble are too many to mention, but just to name a few: Bradley Greenwald using his powerful voice for evil and channeling Professor Harold Hill in his portrayal of con man McMonkey McBean; George Keller, a hoot as Standlee's "Gramlee" who may be a little more open-minded than the other star-bellies; the always wonderful Kim Kivens as Standlee's mom; Elizabeth Reese as a plain-belly who tries (unsuccessfully) to organize the plain-bellies to demand better treatment; Max Wojtanowicz as the proud mayor of the star-bellies; and Michael Wieser as the prim and proper star-belly teacher. 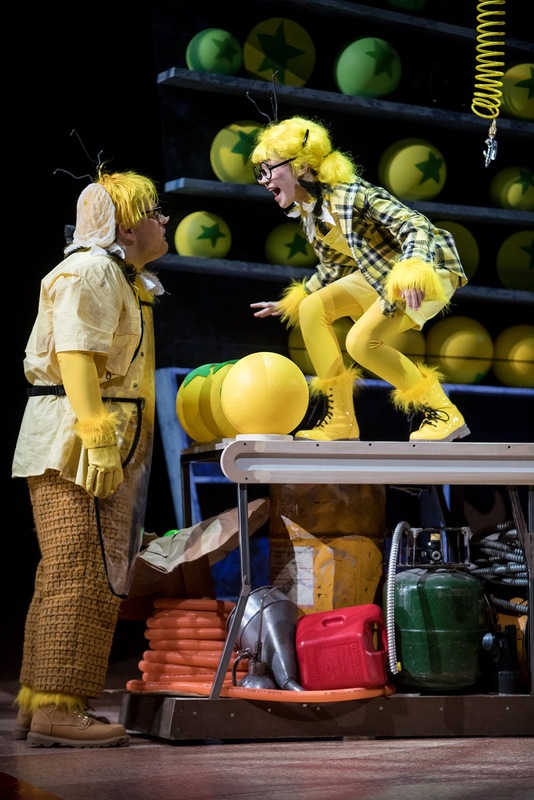 The play is incredibly clever and whimsical, using lots of fun made up words, many of which incorporate "sneetch" (similar to how the Smurfs talk in "smurfs"). Words like "catastrosneetch" and "sneetch Louise!" 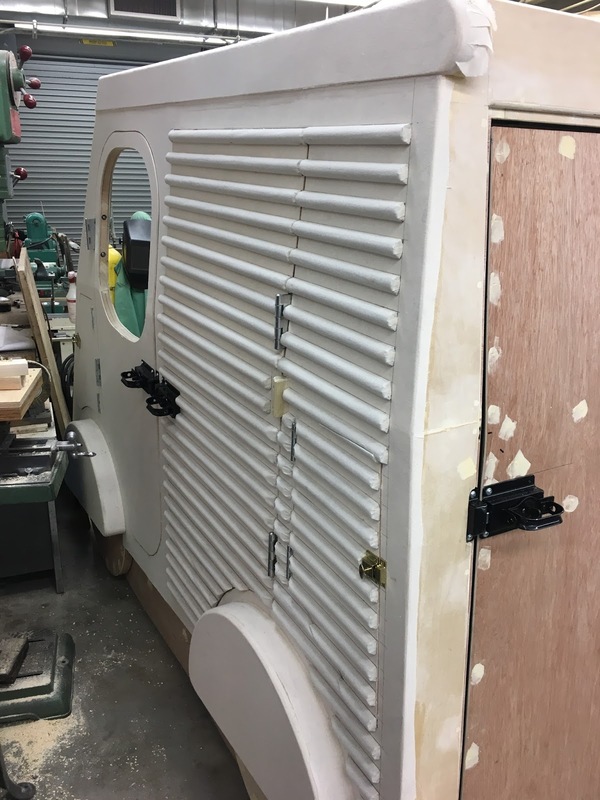 The music, which the creators described as "Tiki music played on Bavarian instruments," is really fun and catchy, along with a few poignant ballads. 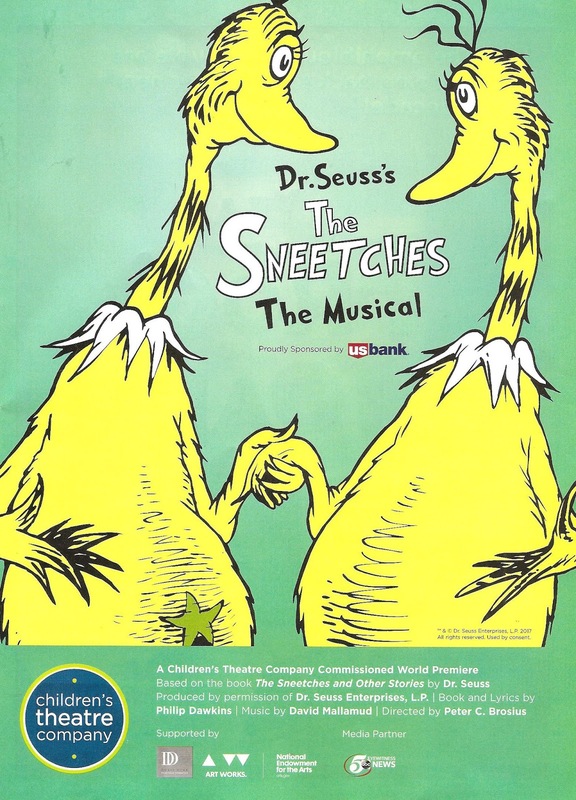 The movement and choreography further define the world, with all of the cast moving in the same Sneetch-like way - the star-bellies taking tiny steps with noses in the air, hands fluttering, the plain-bellies bent over and shuffling like they're carrying the world upon their shoulders. Group dance numbers are fun and playful and come off as organized chaos (watch a rehearsal video of the final song, "How to Be Friends with a Sneetch," here). As aforementioned, the Sneetches in the book are naked, other than their yellow feathers/fur. 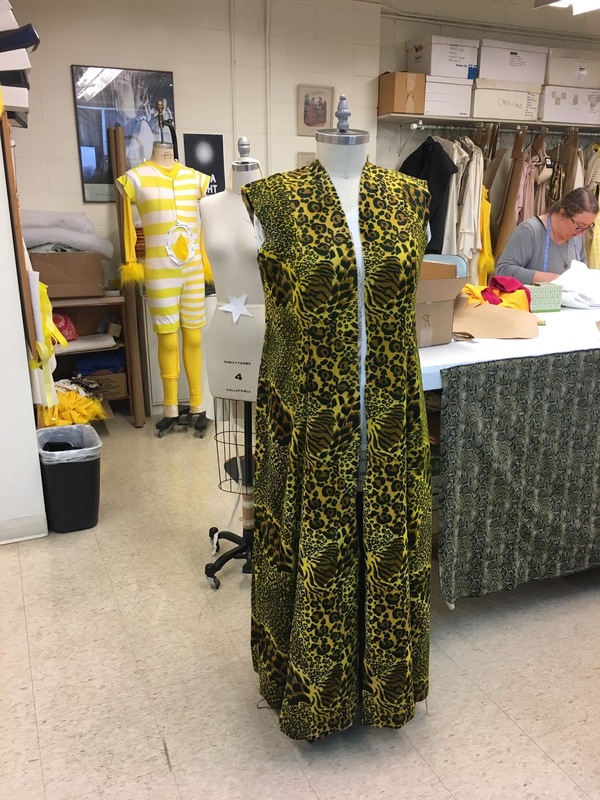 Fortunately CTC's Sneetches are clad in Alex Jaeger's fun, bright, delightful costumes. 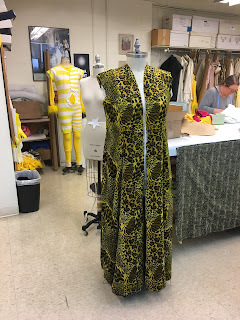 To begin with, everyone is wearing a yellow unitard with fur trim at the wrists and neck, and the clothes on top always have to leave the belly bare to reveal the star or lack thereof. 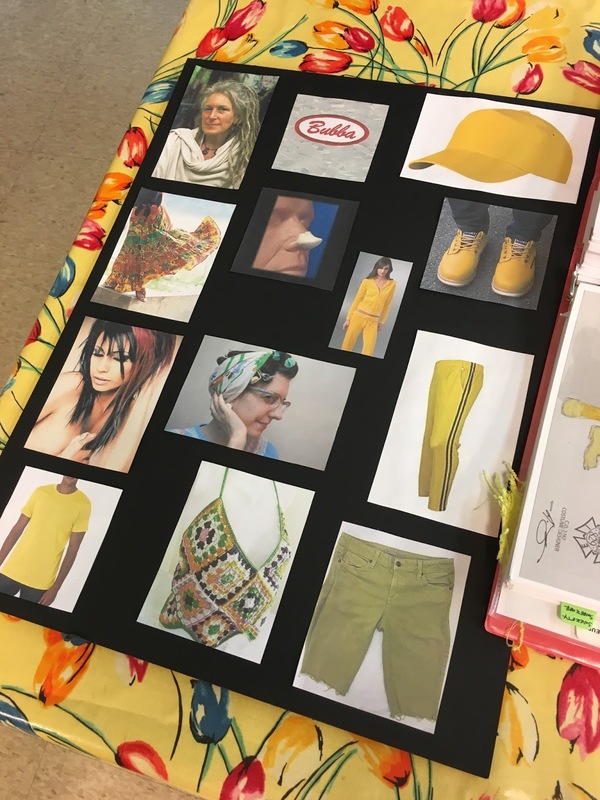 This costuming challenge has become a win, as this show is likely to single-handedly bring back the crop top, so inventive is their use in the different characters' costumes. 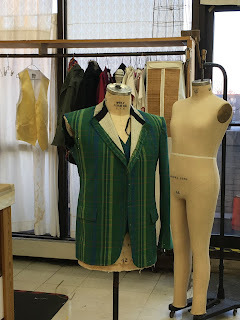 I'm particularly enamored of Mrs. Upplee's cropped blazer and skirt, but all of the combinations are really quite something to behold, and help to define each Sneetch's personality. 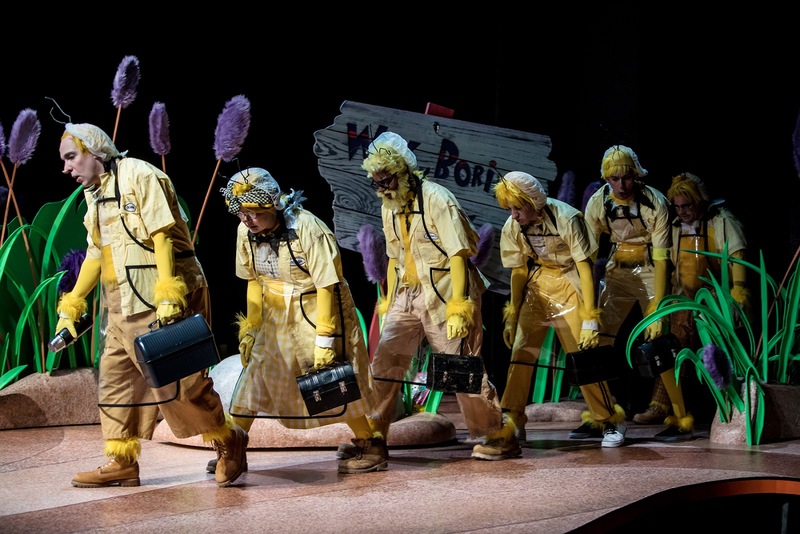 The costumes also help to differentiate the groups; the plain-bellied Sneetches are clad in a slightly duller shade of yellow, as befits their station. Topping off the fantastic costumes are the bright array of yellow wigs. 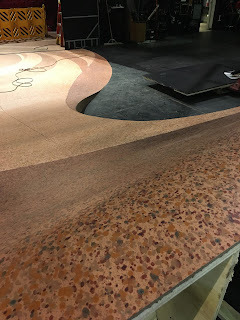 The stage of the Children's Theatre has become a sloped sandy beach, ending in the orchestra pit as the water (which characters jump into!). 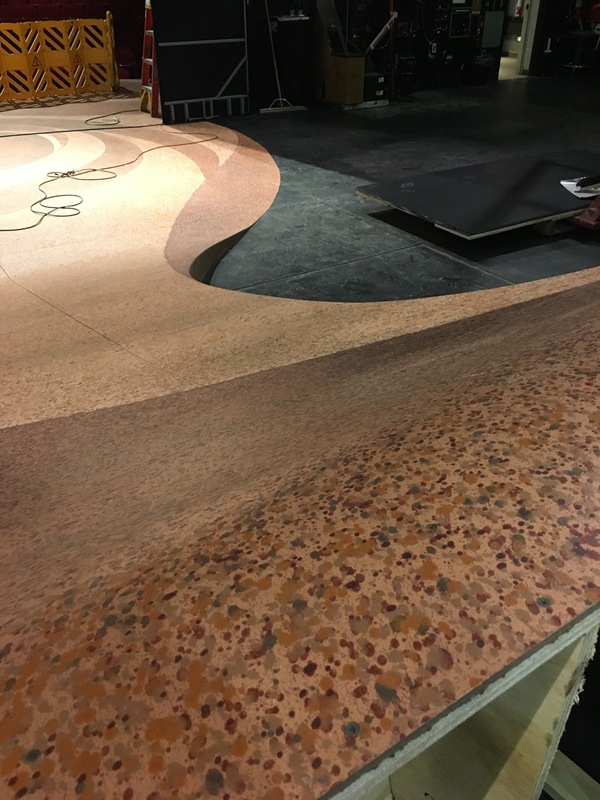 Like an impressionist painting, the beach floor actually has 14 different colors in it. 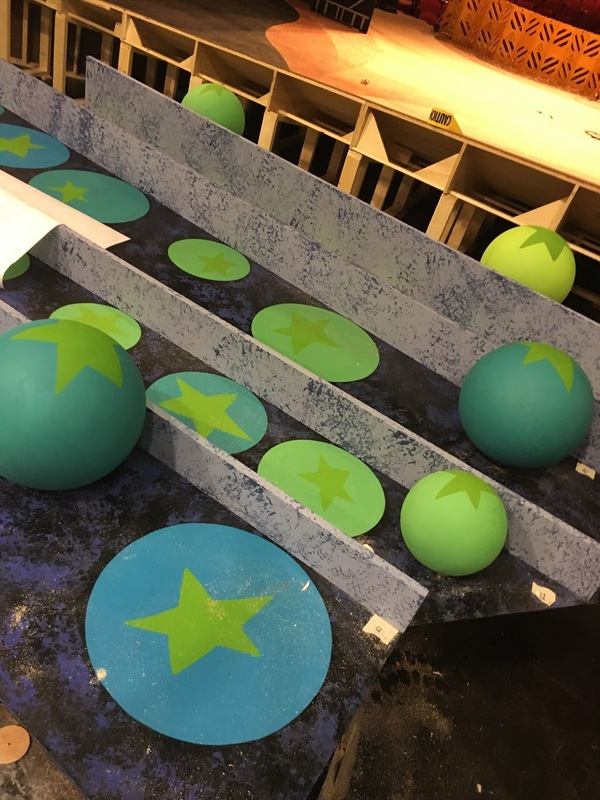 Several backdrops are lowered or rolled in, but the most impressive set piece is the star-on/star-off machine, a van that rolls out onto the stage and opens up long collapsible hallways on either end, through which Sneetches pass and emerge with a different star configuration, invoking that sense of magic (scenic design by William Boles). There's a lovely scene at the end of the play in which Standlee's mother apologizes to her children for teaching them some things that were not right (you've got to be carefully taught), and promises to do better in the future. It's always our children who lead the way in inclusiveness, acceptance, friendship, and love. It comes so easily to them, unless they're taught otherwise. The Sneetches may be a children's story, but I think us grown-ups need it even more than our children. 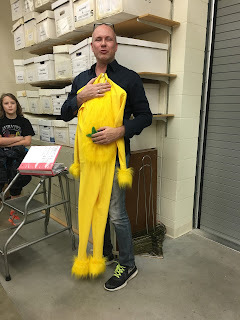 The Sneetches' story reminds us that underneath all that seems to divide us, whether it be the color of our skin, or the shape of our eyes, or the place we were born, or the religion we practice, or the adornment on our bellies, we're all the same. Every Sneetch just wants to be happy and have friends and live a good life. Thanks, Children's Theatre, for bringing us this message just when we need it most. 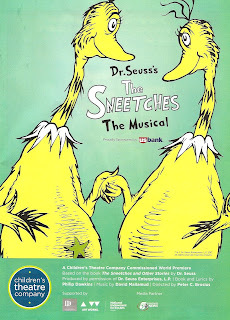 The Sneetches continues through March 26. 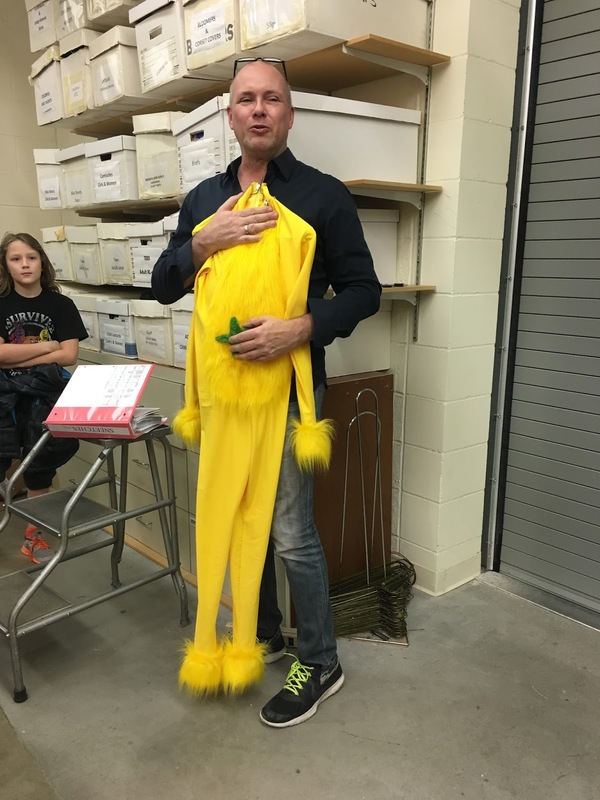 Below are some images from my "Sneetch Peek" backstage tour a few weeks ago.